Though it is quite often very crowded, if you find yourself spending any time in San Francisco, Alcatraz Island is a must visit location. The stories, location, views and mystery surrounding the island are too good to pass up. Here are a few shots from my visit last year. On the boat heading out from Alcatraz Island. The view out behind the boat looked like a scene out of a movie. 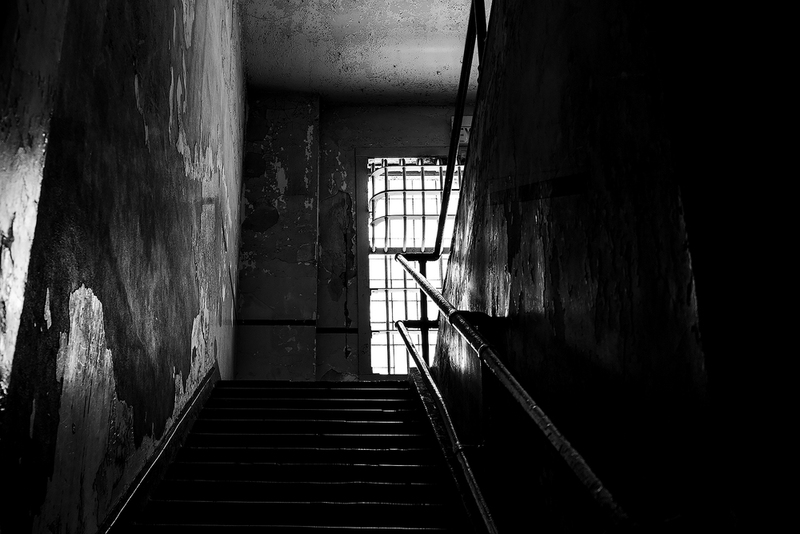 View up the stairs that lead to the prison hospital at Alcatraz. This is the New Industries Building on Alcatraz Island. This area once housed a sewing room and several other services where inmates could work for money. It was constructed in 1939. This is a window through one of the guard residences. Itt must have been hard to sleep with some of the most notorious criminals nearby while waves crash and wind pounds on the windows. View up through the skylights in the cell block. I can't imagine looking up at this scene every day for year after year. A cell in the Alcatraz prison.